Pinyon Publishing in Montrose, Colorado has done its part to promote National Poetry Month this April by producing several notable books of poetry by nationally-acclaimed poets. Among the outstanding volumes published is a collection of poetry by Stuart Friebert, an audacious poet who will captivate poetry lovers with Floating Heart. This collection features poems of probity and liveliness that pay attention to the familiar and ordinary and will startle readers with their fierceness. The poems are rendered with the exactness of memory, dark humor, and a particular aptness when Friebert describes the changeability of "the floating heart." Friebert pulls aside the curtain and reveals, with authoritative insight, the foibles of the human heart and the existential attitude that sometimes lies beneath the surface of ordinary people. In "But That the Wicked Turn From Evil Ways and Live," readers can identify with being "a long way from here, closer to Eden, wishes/will amount to nothing. But we don't know how/to get there...It would have been just/the same if there were no God whom we watch/for, expect to return on foot, indignant, to claim/his imperfect children. But. And. But. And..." And take a deep breath. Yet, hope forces its way into the business of survival and shows the emotional power–and poignancy– of Friebert's writing in a short poem featuring the poet's father and mother speaking to the subject of "The Will" they haven't prepared and the mortality they haven't faced --their claim being "there was little wealth,/but enough gaiety; and we were/never done with our food. Standing/in our socks, starting some old joke./Life being different from death; hoping/we might go on and on and on." Friebert is at his most masterfully wry in "Pink Of the Evening," poking fun at authors Gertrude Stein and Ernest Hemingway, leading off with the choice line of "Pink is as pink supposes..." with Hemingway coming over to visit Stein for "something to drink, work to show,/advice to get,/but we can't be sure..." And for those of us who know the story, from first to last lines the poem is pure irony because of Hemingway's friendship and eventual bitter parting with Stein. Noteworthy are two laugh aloud lines when Alice Toklas and Stein are discussing whether birds that appear while they're having drinks are ravens or waxwings: "'Who cares?' Gertrude would sigh, 'As/long as Mr. Hemingway won't shoot them'..." Needless to add that Hemingway shot most creatures that appeared in his gun sights! To me, the most anguishing poem in Floating Heart is entitled "Near Dachau," a poem that is simply declarative but charged with emotional power as the poet speaks of the Allies arriving "too late" at Dachau and find "the enormous/ditches still smoldering on the far/side of the rusting barbed wire." Robust and direct, these portraits of inner moods, authentic and imagined characters, cover the expansive range of a consummate poet's experience. They are alternately serious and hilarious and allow readers to develop a new perspective about death, family, society, and the intimacies of human lives and their "floating hearts." Stuart Friebert taught at Mt. Holyoke College, Harvard, and Oberlin College where he founded and directed Oberlin's Creative Writing Program until retiring in 1997. He also taught at this college, co-founded Field Magazine, the Field Translation Series, and Oberlin College Press. He has published a dozen books of poems, ten volumes of translations, prose stories, memoir pieces, and critical essays. He has received an N.E.A. Fellowship in poetry and numerous awards for poems and translations, including the Four Way Book Award for Funeral Pie. 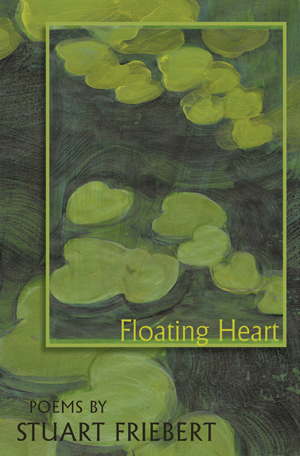 Floating Heart is available at Pinyon Publishing, 23847 V66 Trail, Montrose, Colorado 81403.